Note: The information on this page refers to the 1st edition of this book. 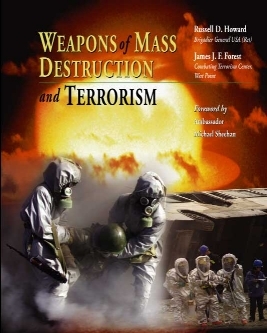 Definitions, Trends, and the Concept of "New Terrorism"
Terrorist Use of Weapons of Mass Destruction: How Serious is the Threat? Assessing the Role of the Nonproliferation Regimes: Are they Relevant Tools for Countering WMD Terrorism? Brigadier General (retired) Russell Howard, a career Special Forces officer, is the Director of the Jebsen Center for Counterterrorism Studies, and former Head of the Department of Social Sciences at the U.S. Military Academy. He has had numerous antiterror and counterterror responsibilities and has taught and published several books and articles on terrorism subjects, including Homeland Security and Terrorism: Controlling the Security Environment (McGraw-Hill, 2005) and Terrorism and Counterterrorism: Readings and Interpretations (McGraw-Hill, 2002). As a Special Forces officer, Brigadier General Howard served at every level of command, including: Detachment Commander in the 7th Special Forces Group, Company Commander in the 1st Special Forces Group, Battalion Commander in the Special Warfare Center and School and Commander of the 1st Special Forces Group. In preparation for his academic position, Brigadier General Howard earned degrees from San Jose State University, the University of Maryland, the Monterey Institute of International Studies, and Harvard University.